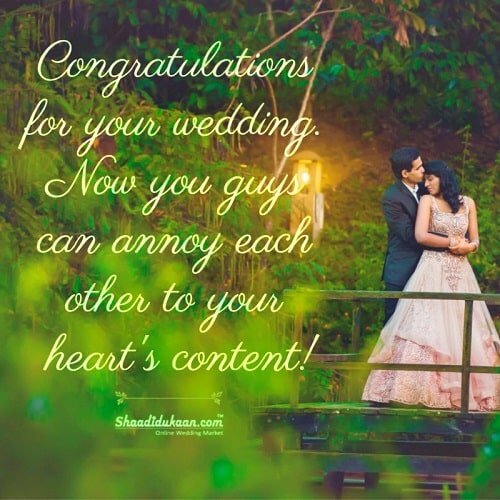 In the era of Whatsapp and video calling, writing rib-tickling and heartfelt wedding wishes for the newly married couple is something that very few individuals love to do. 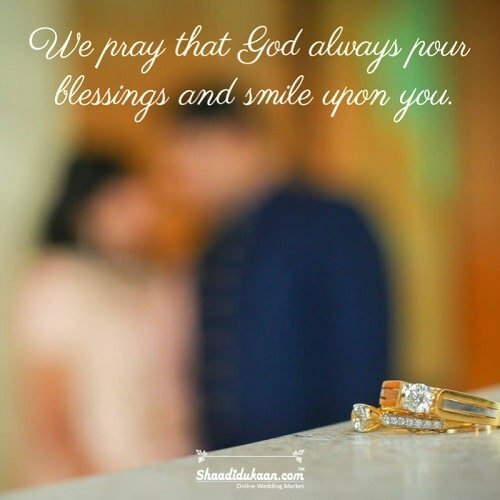 A written wedding wish has its own charm. There are no pre-defined rules to write a wedding card as longs as you are pouring down genuine emotions in the message. 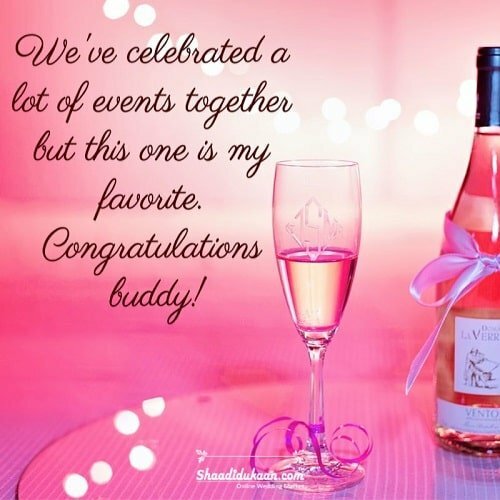 Struggling to write the creative wedding congratulations wishes? No need to worry. 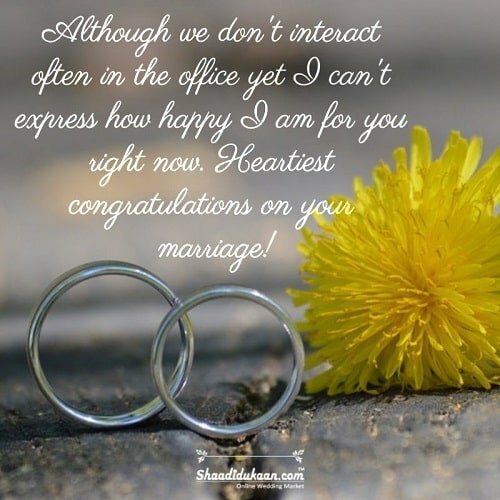 In this comprehensive post, we are going to state how to write a meaningful and heart-touching wedding card wishes and what to write on a wedding card. 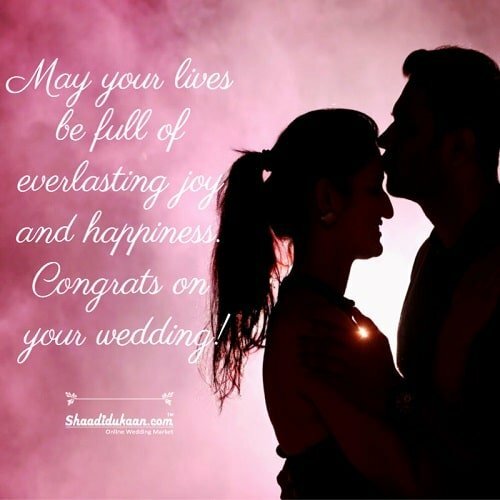 Congratulate the Couple (Write individual names) Heartiest congratulations, Mr. X and Mrs. Y! 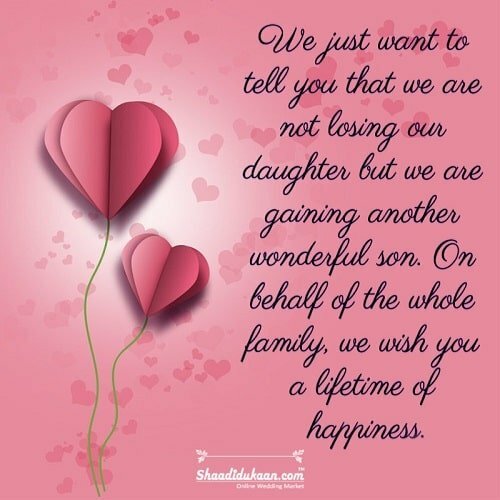 Write a Heartfelt Wishing - I wish you an astonishing and joyous life ahead. May you guys achieve all the happiness and opulence of the world and overcome every obstacle in your life. Thank Them I am very thankful to both of you for inviting me on your auspicious occasion. It truly means a lot to me. Sign Off with Warm Wishes Have an amazing and swash-buckling life ahead. This is a general structure of how the wedding messages should be. You can take time to explore more unique and intriguing wedding message ideas to create an awe-inspiring wedding card message. 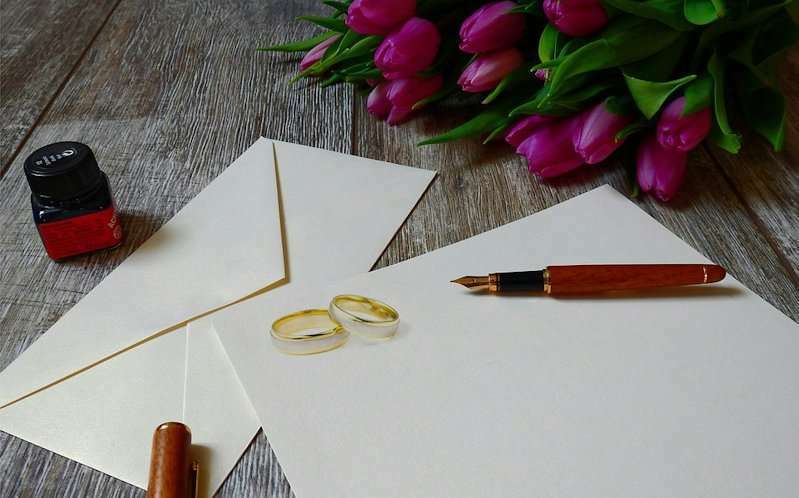 Before you know what to write on a wedding card, it is imperative to consider how strong your bond with the couple is. 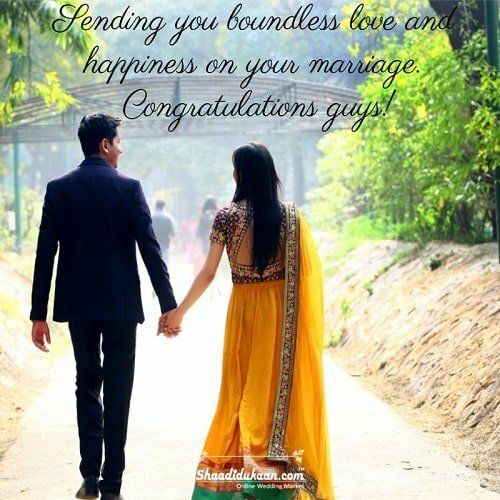 If you have a very close relationship with the newly wedded couple then, you can write funny, satirical, hilarious wedding messages and vice versa. 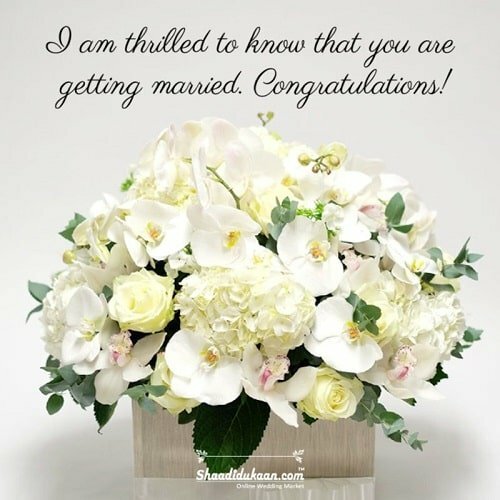 A wedding card message should be engaging, lovely, evoking, and easy to understand. 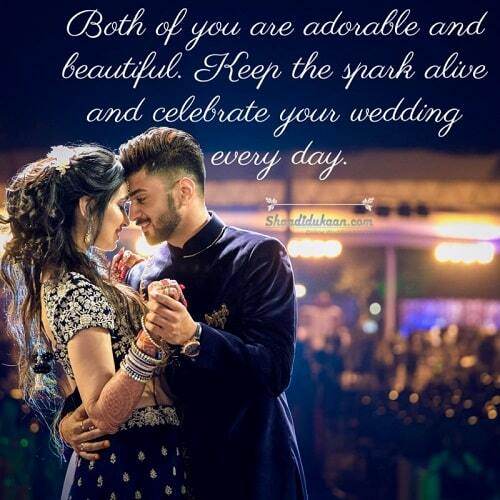 You should customize the wedding message as per your relationship with the person. 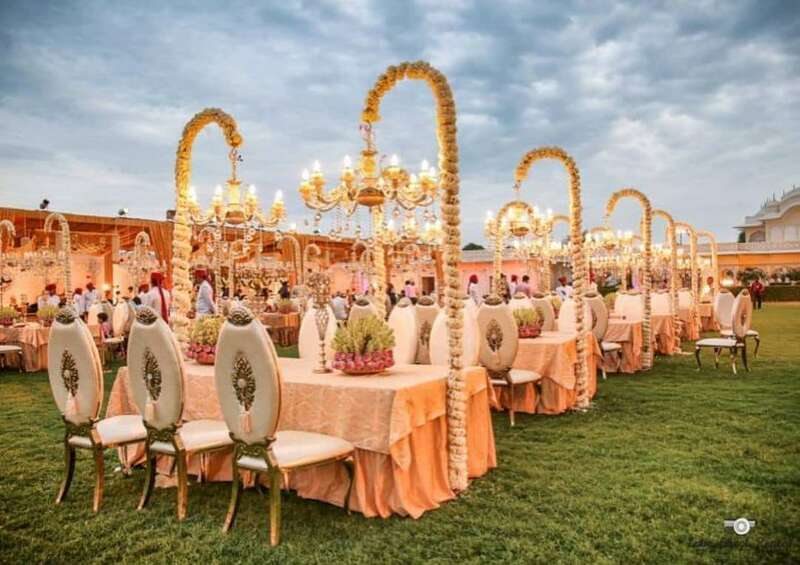 Below, we have collated some out of the box and gripping wedding wishes and wedding quotes that help you to craft an eyeball-grabbing and drool-worthy wedding message. Try some snarky one-liners or write something funny that will make the couple laugh hard. When writing a hilarious wedding wish, ensure you are not crossing any line or intent of your message should not hurt the couple in any way. Moreover, avoid using the word divorce in the wish. 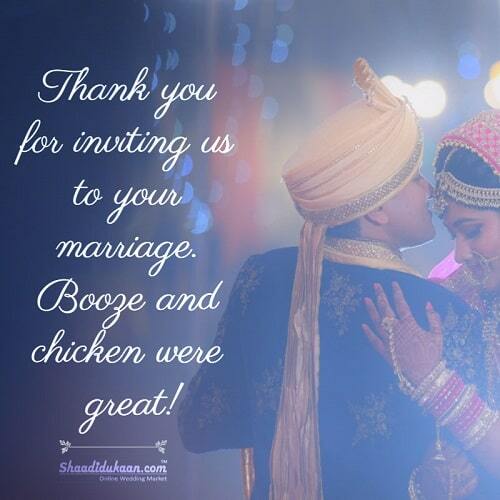 Here are some rib-tickling wedding wishes you can write on a wedding card. Thank you for inviting us to your marriage. Booze and chicken were great! The key to happy and successful marriage your wife is always right and in case she is wrong, say sorry to her! 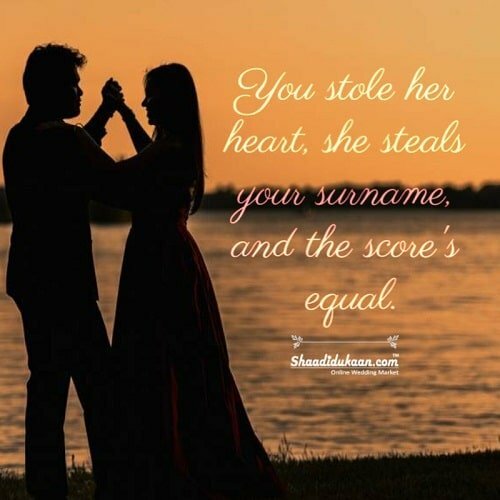 You stole her heart, she steals your surname, and the score's equal. Congratulations for your wedding. Now you guys can annoy each other to your heart's content! Congrats guys on getting married! 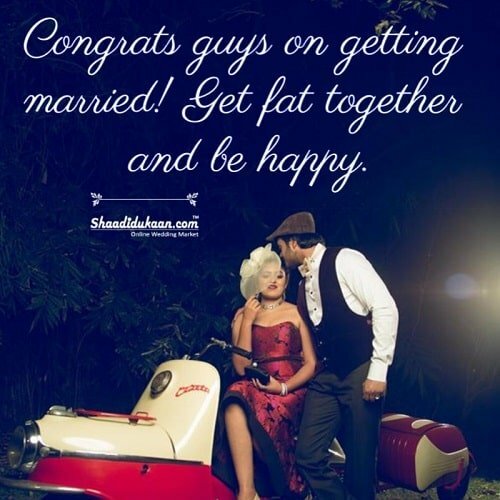 Get fat together and be happy. I knew you guys were deeply in love with each other but I didn't know you will be crazy enough to marry. 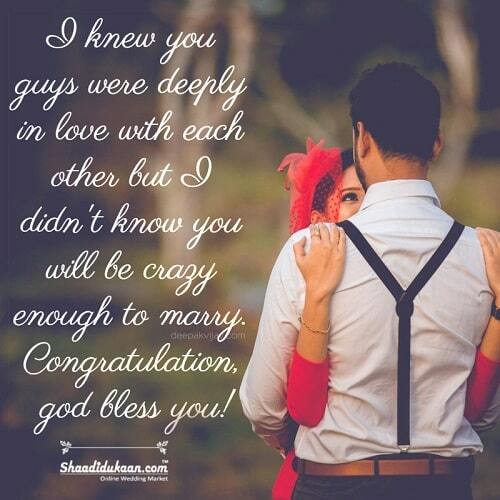 Congratulation, god bless you! 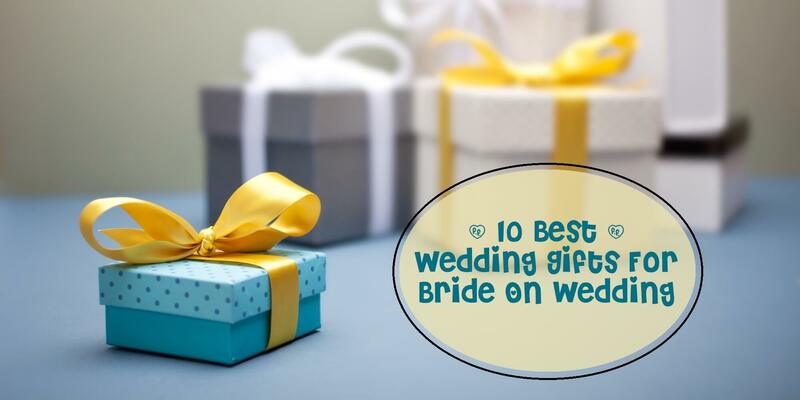 If you are unable to come up with sarcastic and funny ideas, go for formal wedding wishes. 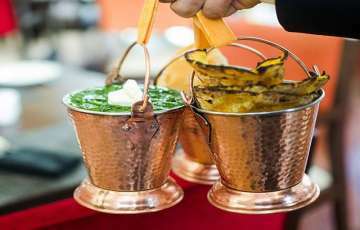 They are evergreen to use and also reflect a reverence for the person. 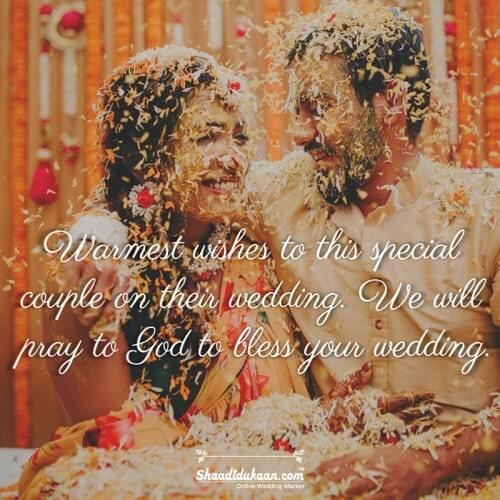 Here are some formal wedding wishes we have jotted down. Wishing you guys an amazing and happy married life ahead. At last, you guys hitched. Make the most out of your relationship and have a blast. Both of you are adorable and beautiful. Keep the spark alive and celebrate your wedding every day. You two are made for each other. 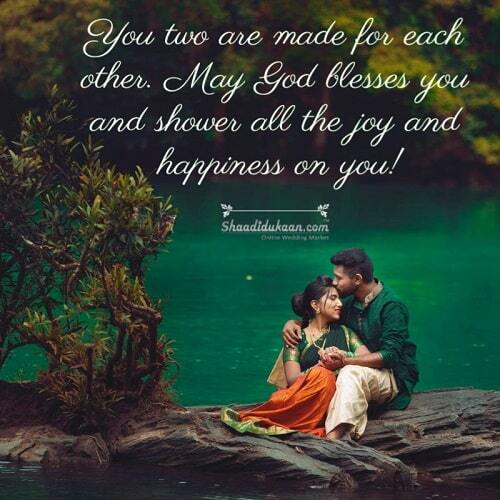 May God blesses you and shower all the joy and happiness on you! Happiness is only real when shared. 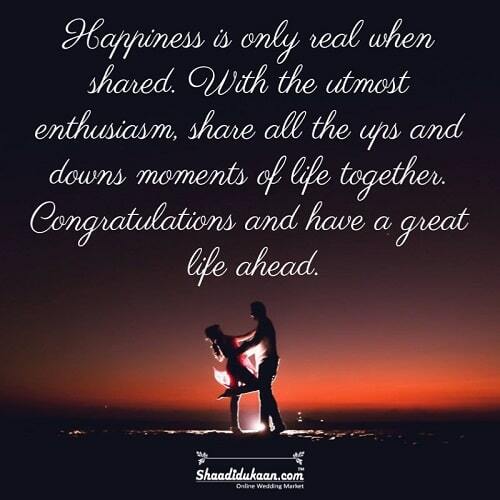 With the utmost enthusiasm, share all the ups and downs moments of life together. Congratulations and have a great life ahead. You two are beautiful people and make a wonderful couple. I wish you the life-long happiness and honeymoon. May your lives be full of everlasting joy and happiness. Congrats on your wedding! 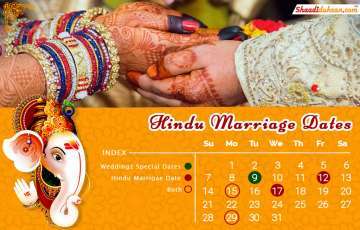 If the couple is religious and has the utmost faith in God then, religious wishes on a wedding card can make their day and put a big smile on their face. Try to induce the general religious words in the message. 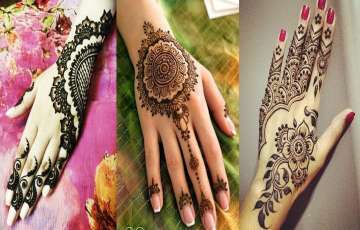 Below are some examples. 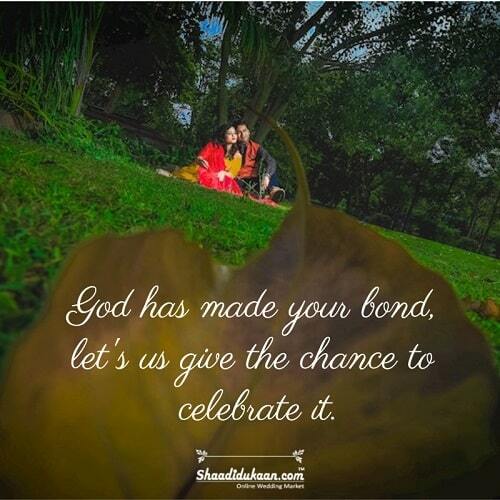 God has made your bond, let's us give the chance to celebrate it. 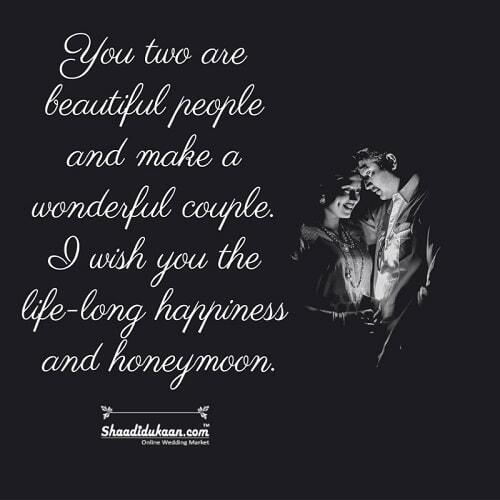 Sending you boundless love and happiness on your marriage. Congratulations guys! We pray that God always pour blessings and smile upon you. Warmest wishes to this special couple on their wedding. 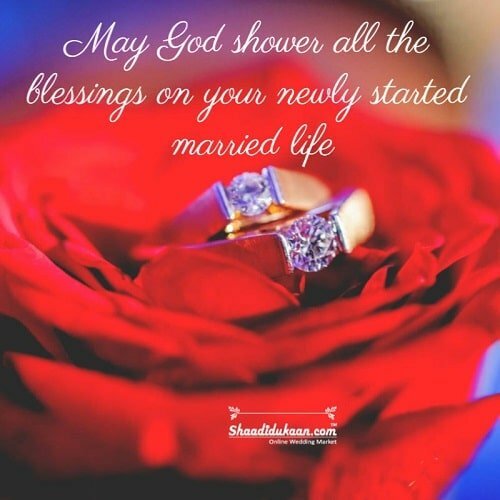 We will pray to God to bless your wedding. Nobody knows your siblings better than you. For your brother and sister, you can write up crazy wishes. But when it comes to sister-in-law or brother-in-law, the relationship is fettered and you should keep wedding wishes plain and general. Don't forget to mention the name of the spouse on the wedding card! I can't express in words how happy I am for my brother/sister marriage. Now go and ruin your partner's life. 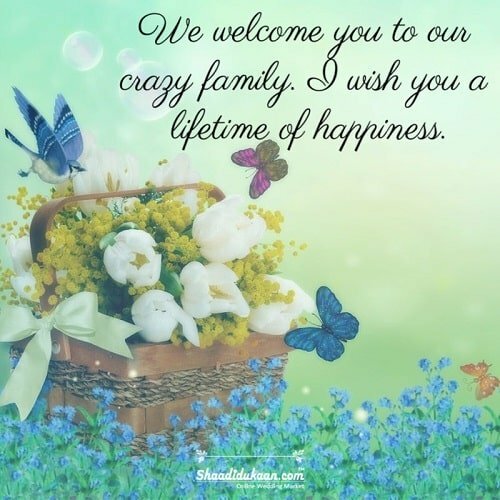 We welcome you to our crazy family. 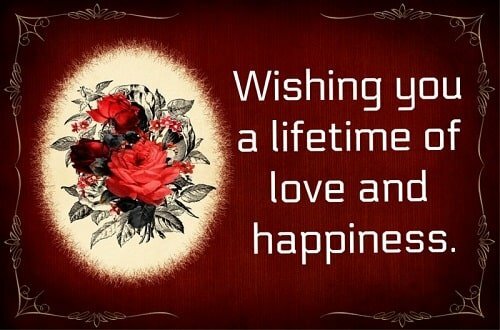 I wish you a lifetime of happiness. 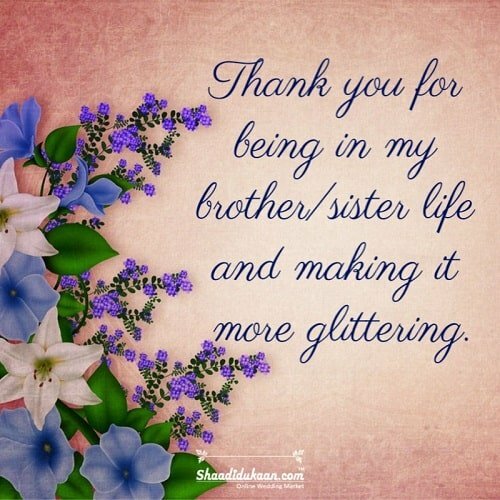 Thank you for being in my brother/sister life and making it more glittering. 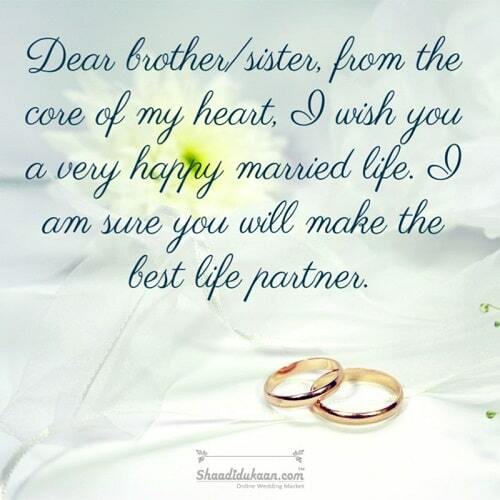 Dear brother/sister, from the core of my heart, I wish you a very happy married life. 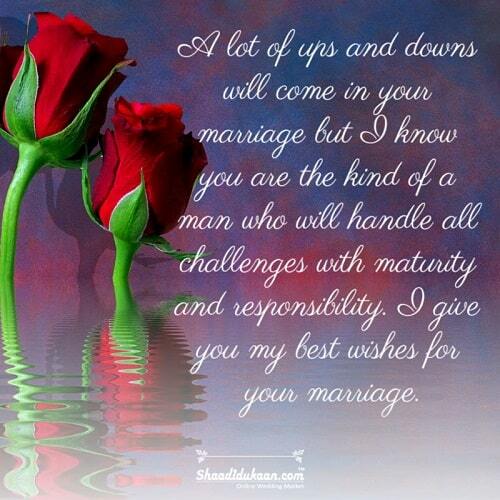 I am sure you will make the best life partner. 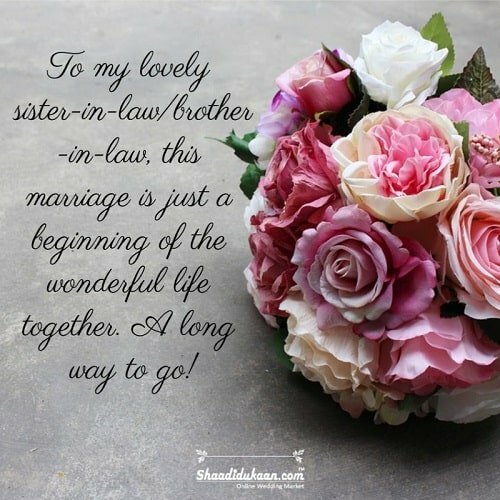 To my lovely sister-in-law/brother-in-law, this marriage is just a beginning of the wonderful life together. A long way to go! 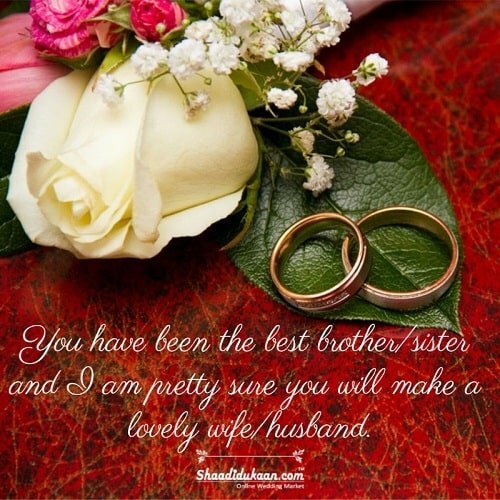 You have been the best brother/sister and I am pretty sure you will make a lovely wife/husband. 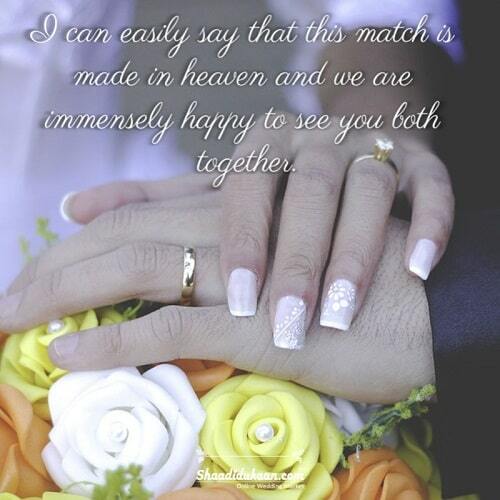 I can easily say that this match is made in heaven and we are immensely happy to see you both together. Friends are no less than a family. 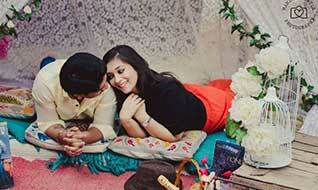 You surely want to pour down your feelings in form of words to show them, how happy you are on their marriage. If you are unable to find the right words to express your joy, these heartfelt messages will surely help you out. I still can't believe you are getting hitched. 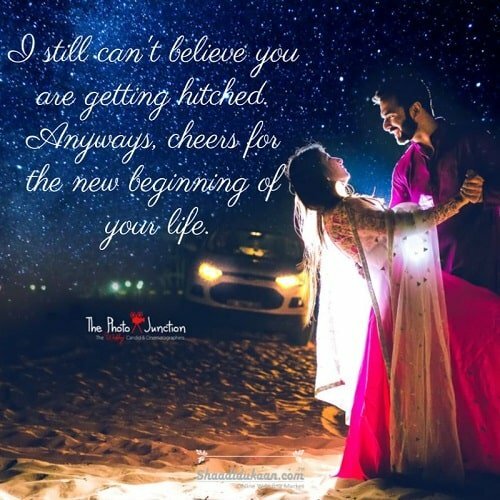 Anyways, cheers for the new beginning of your life. We've celebrated a lot of events together but this one is my favorite. Congratulations buddy! 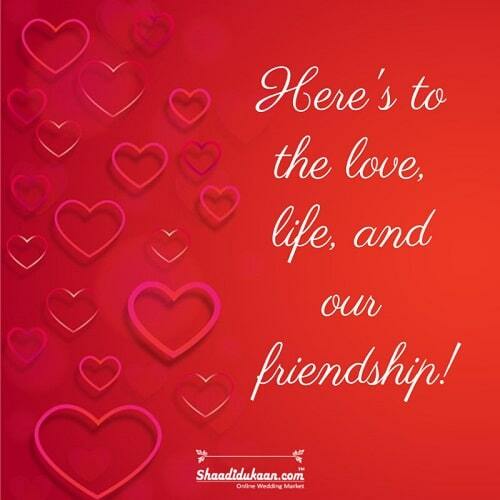 Here's to the love, life, and our friendship! Congratulations on your wedding my friend! 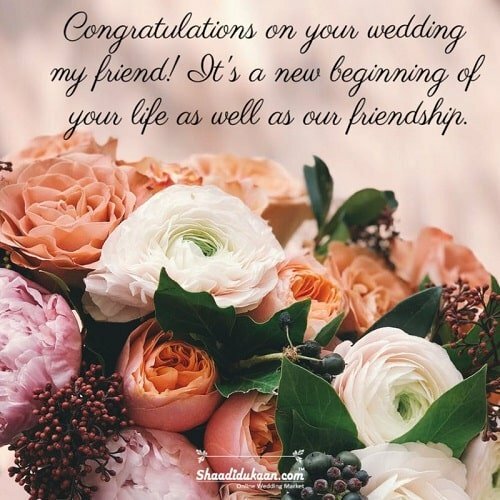 It's a new beginning of your life as well as our friendship. 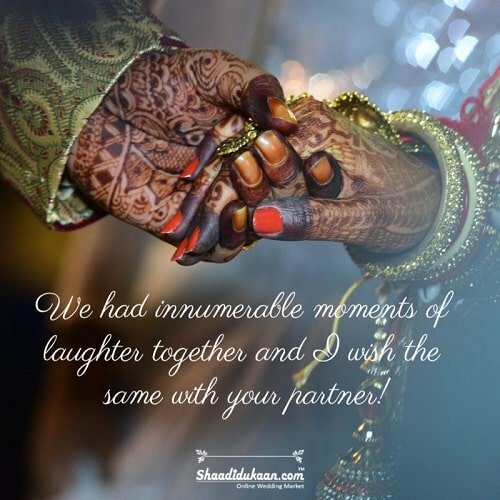 We had innumerable moments of laughter together and I wish the same with your partner! 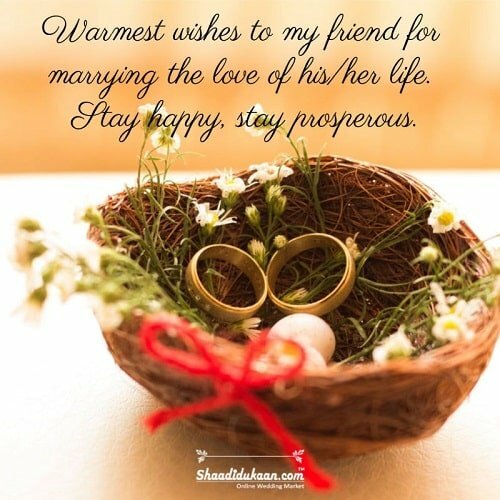 Warmest wishes to my friend for marrying the love of his/her life. Stay happy, stay prosperous. 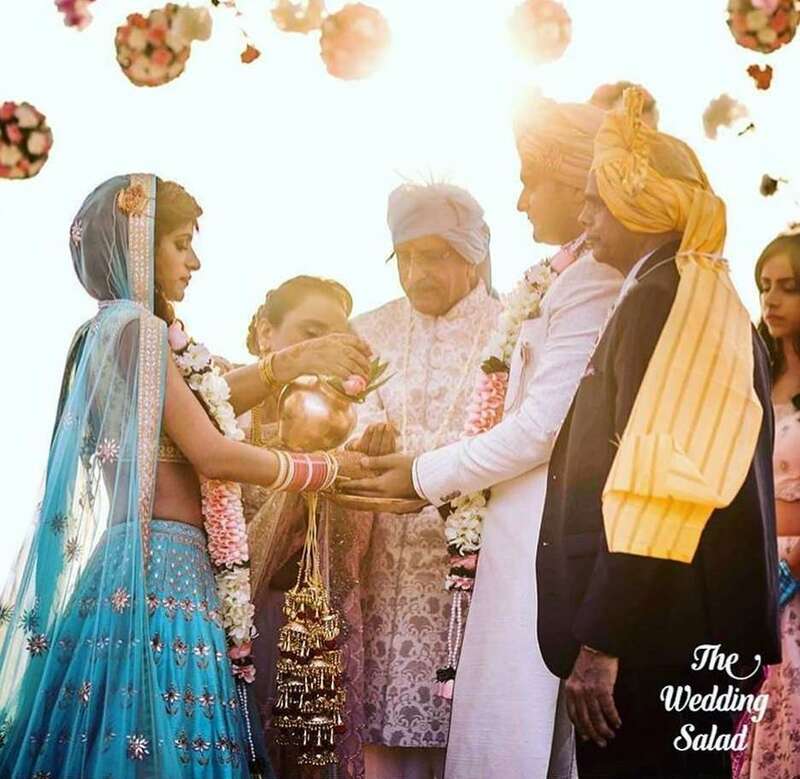 It is surely a big day for parents when their son get hitched with the love of his life. As a father or mother, you must be brimming with emotions, happiness and would like to speak your heart out. 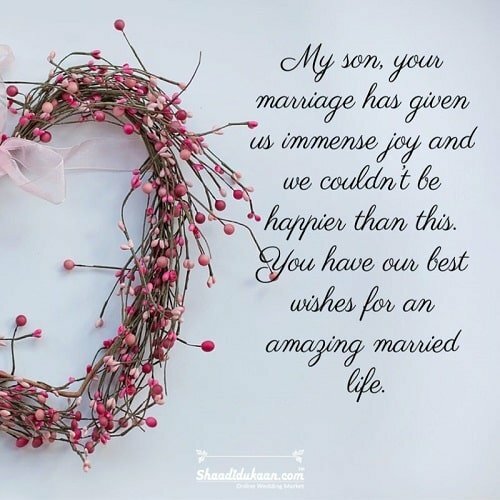 If you don’t know what wedding wishes to write to congratulate your son/son-in-law, you should check out our compiled wedding wishes and give your wedding card a meaning. My son, your marriage has given us immense joy and we couldn’t be happier than this. 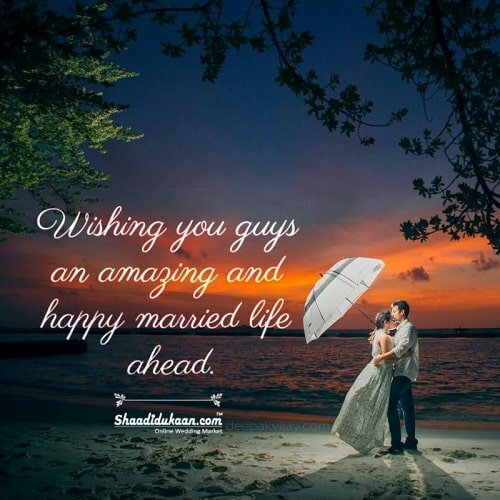 You have our best wishes for an amazing married life. We wholeheartdly welcome the newest member of our family. 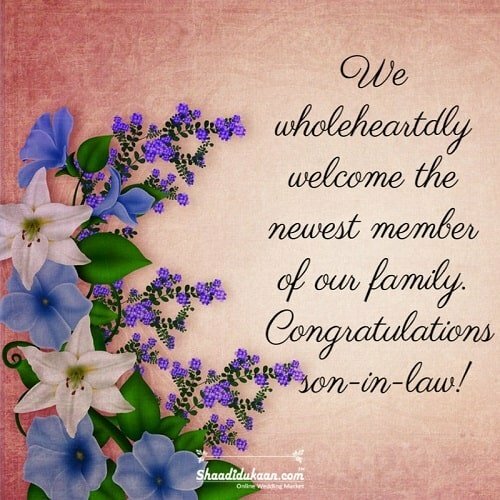 Congratulations son-in-law! 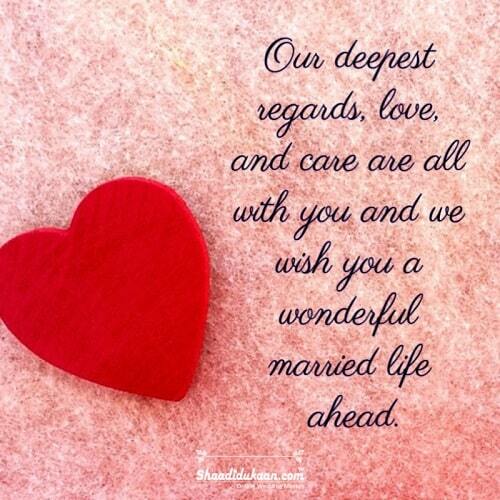 Our deepest regards, love, and care are all with you and we wish you a wonderful married life ahead. We just want to tell you that we are not losing our daughter but we are gaining another wonderful son. On behalf of the whole family, we wish you a lifetime of happiness. What a magnificent day of our life. Son, we are proud of you that you have chosen the right life partner. 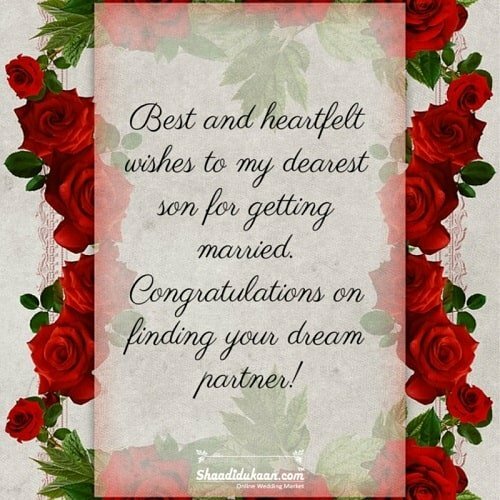 Best and heartfelt wishes to my dearest son for getting married. 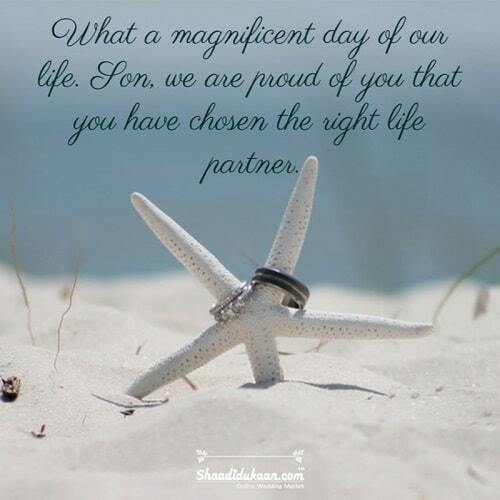 Congratulations on finding your dream partner! It is no brainer that parents shower more love and affection on their daughters than their sons. A daughter is no less than a princess for her father and a friend for her mother. Surely, the wedding of the beloved daughter can fill any parents’ with the utmost joy, happiness, and emotional outburst moments. 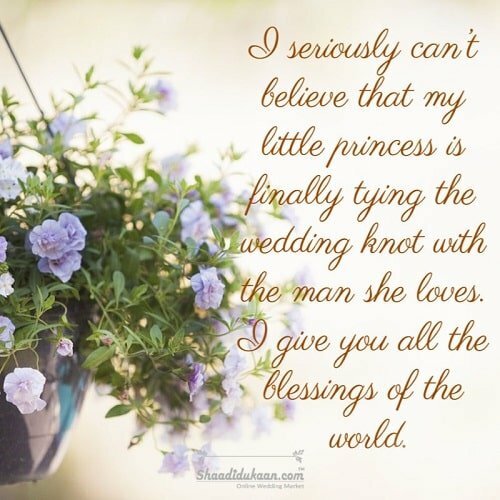 If your little princess has decided to marry the love of her life, just let her know that you are standing by her side by sending sentimental wedding wishes for daughter/daughter-in-law. It is filing me with utmost delight that finally, you have found the man with whom you like to spend the rest of your life. Congrats my lovey-dovey daughter. I seriously can’t believe that my little princess is finally tying the wedding knot with the man she loves. I give you all the blessings of the world. I am so thankful to almighty for keeping me alive to be a witness of my loving and beautiful daughter. 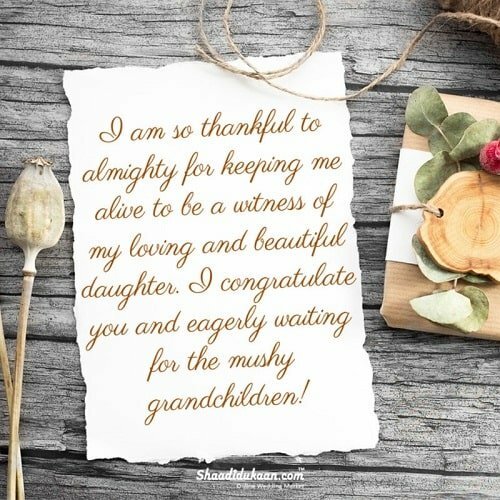 I congratulate you and eagerly waiting for the mushy grandchildren! 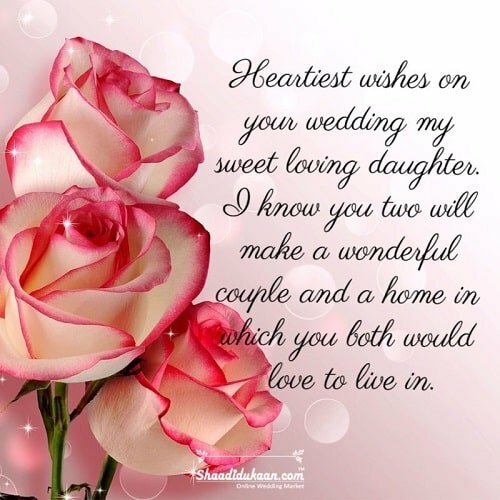 Heartiest wishes on your wedding my sweet loving daughter. I know you two will make a wonderful couple and a home in which you both would love to live in. You have fulfilled my wish of having a son. Always stand by his side and held him close, no matter how turbulent the circumstances are. May the lord shower unlimited happiness, opulence, and merriment in your life. 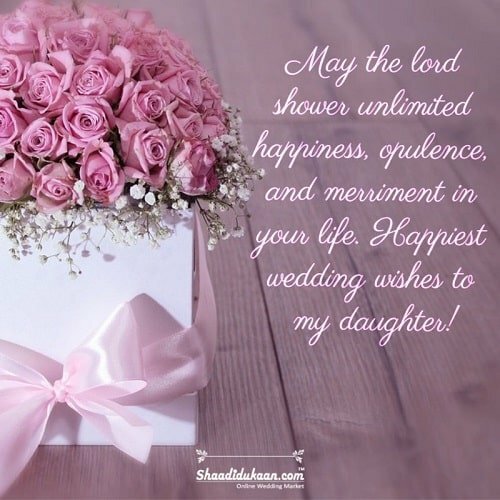 Happiest wedding wishes to my daughter! 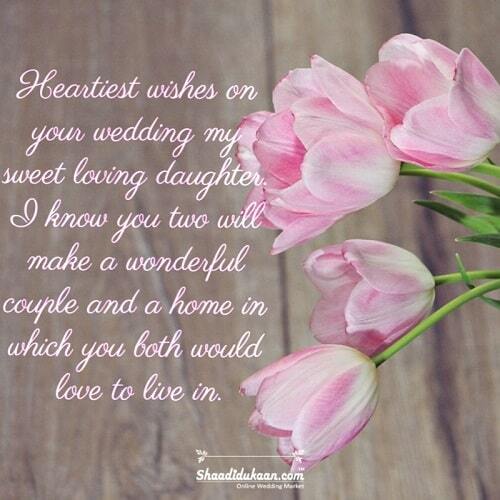 Writing a genuine and heartfelt wedding wishes are easy when you are writing them for your son or daughter. 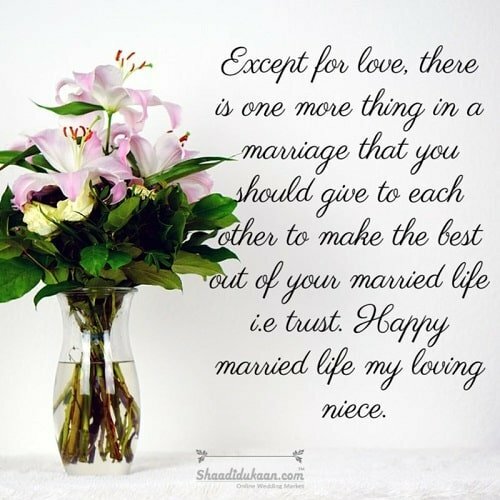 People often feel bamboozled when it comes to writing the wedding wishes for a nephew or niece. Let your nephew/niece know how much you love and care about them by writing the sentimental wedding wishes on the wedding card. I am so ready and immensely happy to welcome a new member to our family. 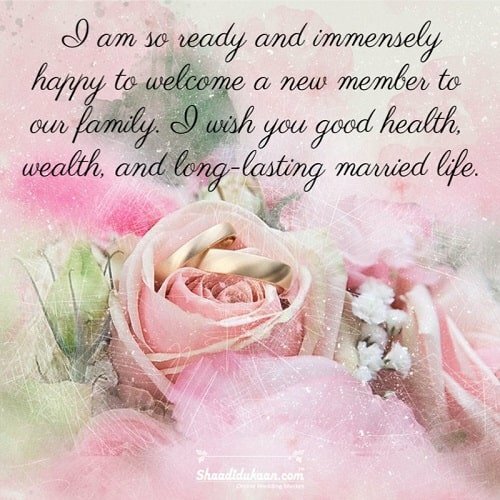 I wish you good health, wealth, and long-lasting married life. A lot of ups and downs will come in your marriage but I know you are the kind of a man who will handle all challenges with maturity and responsibility. I give you my best wishes for your marriage. 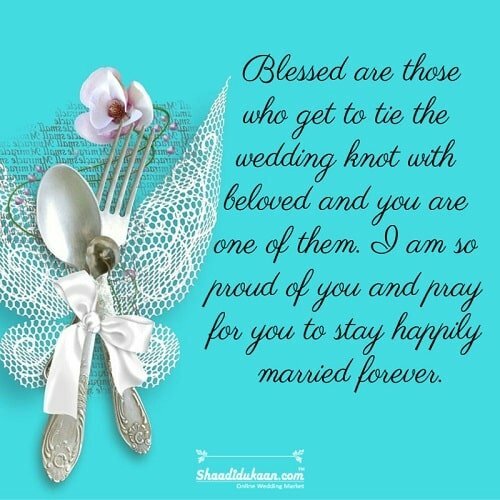 Blessed are those who get to tie the wedding knot with beloved and you are one of them. I am so proud of you and pray for you to stay happily married forever. 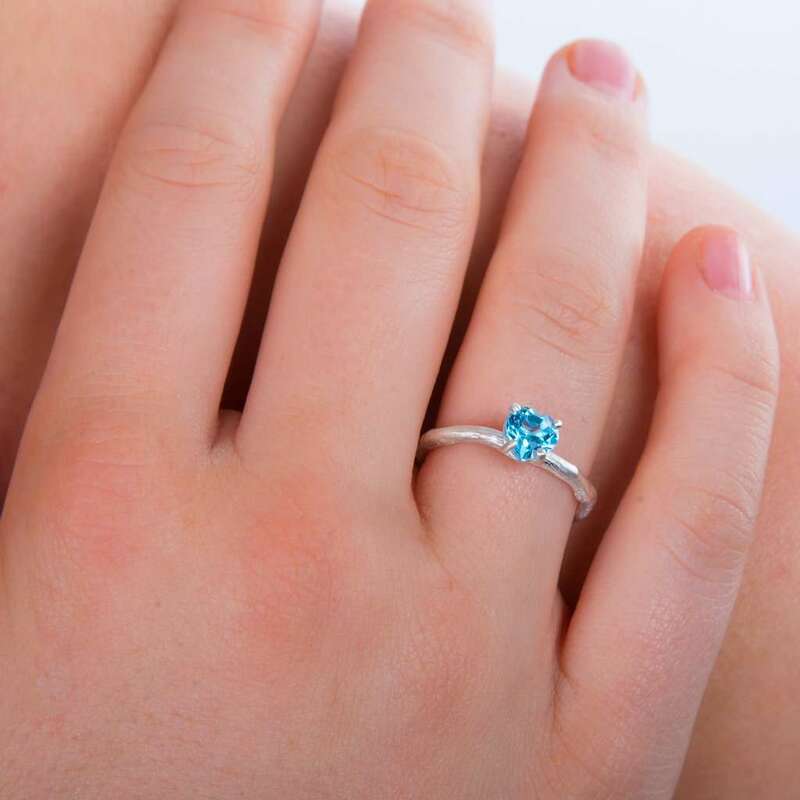 Except for love, there is one more thing in a marriage that you should give to each other to make the best out of your married life i.e trust. Happy married life my loving niece. To enjoy the married life to the fullest, you must admire each other and neglect the flaws. 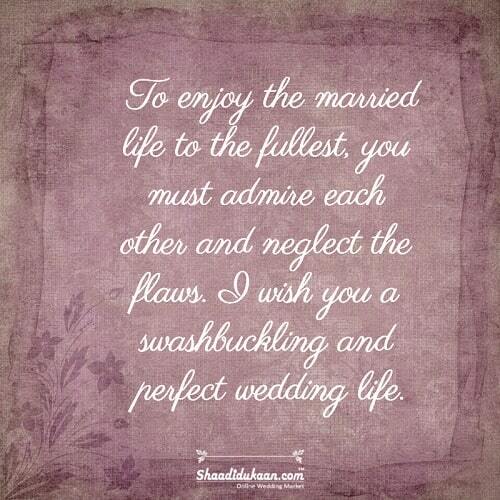 I wish you a swashbuckling and perfect wedding life. 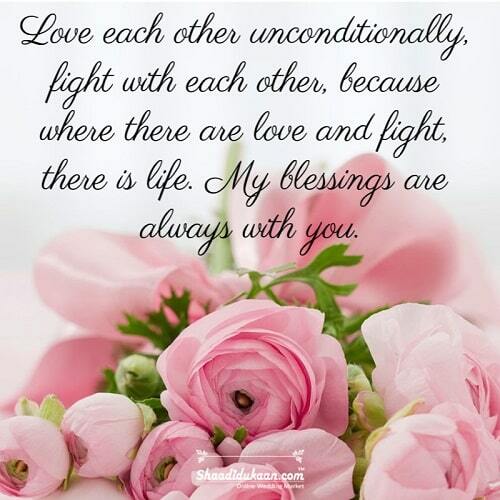 Love each other unconditionally, fight with each other, because where there are love and fight, there is life. My blessings are always with you. Like family and friends, office coworkers are also an indispensable part of your life. Unless the office colleague is your close friend, we suggest you not to use informal tone. Use these amazing formal examples mentioned below. 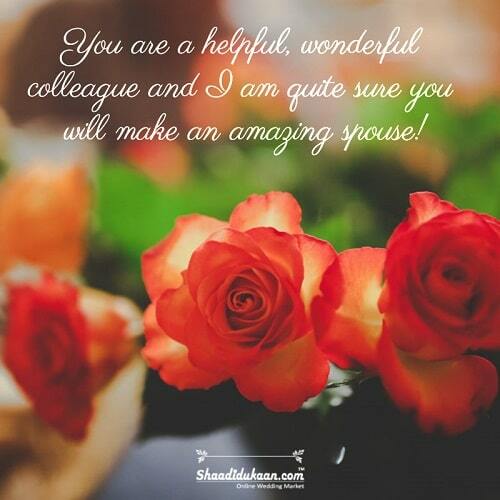 You are a helpful, wonderful colleague and I am quite sure you will make an amazing spouse! Although we don't interact often in the office yet I can't express how happy I am for you right now. Heartiest congratulations on your marriage! Finally! 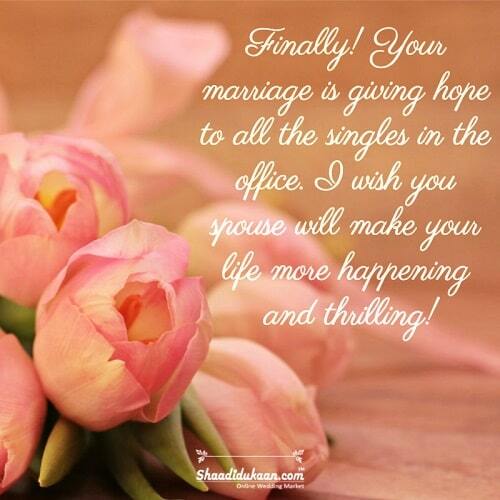 Your marriage is giving hope to all the singles in the office. 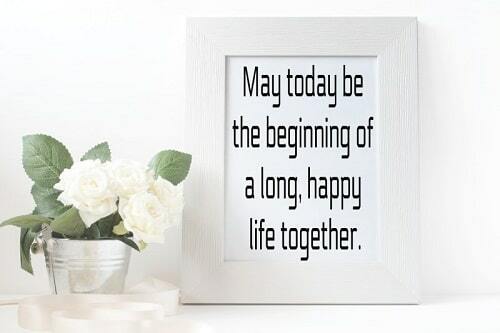 I wish you spouse will make your life more happening and thrilling! 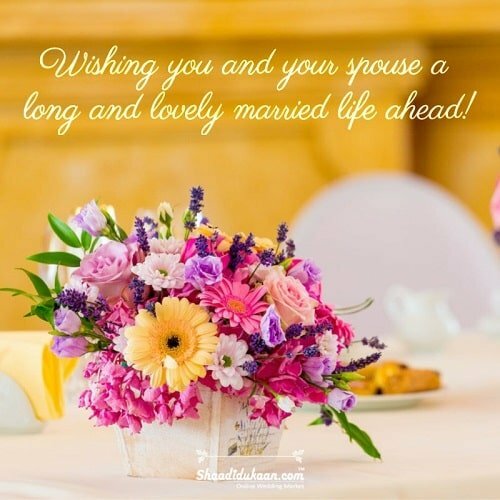 Wishing you and your spouse a long and lovely married life ahead! I am thrilled to know that you are getting married. Congratulations! Writing a wedding wish is not a big deal but how you write the message is what actually matters. 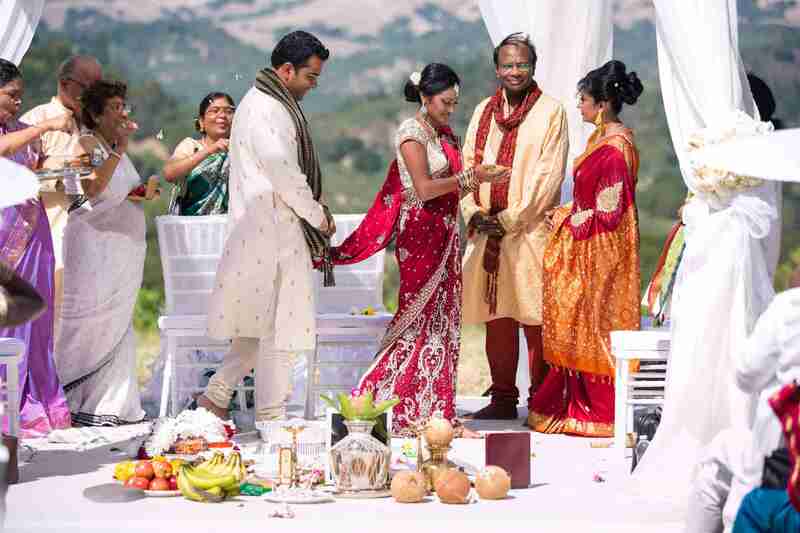 Before you jot down the wedding wishes, the pivotal thing you must keep in mind is the relationship with the individual or the couple to whom you want to congratulate. We have compiled some significant questions that will help you to figure out what you should write to avoid glitches. 1. 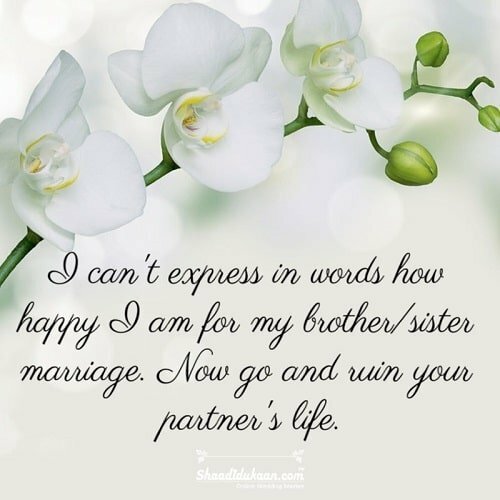 What is your relationship with The Bride or groom? 2. 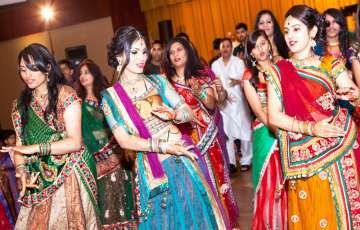 What is the theme of The Wedding Function? 3. 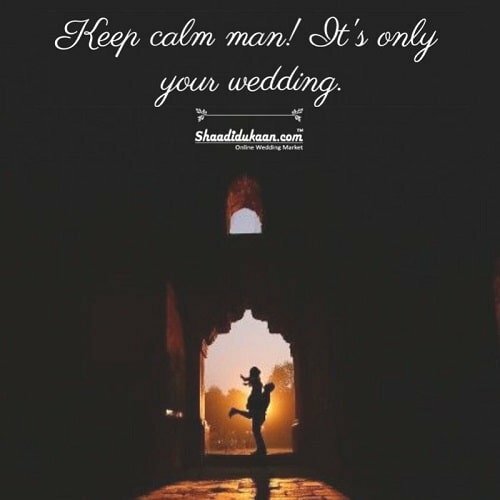 Are you close enough with the bride or groom? 4. 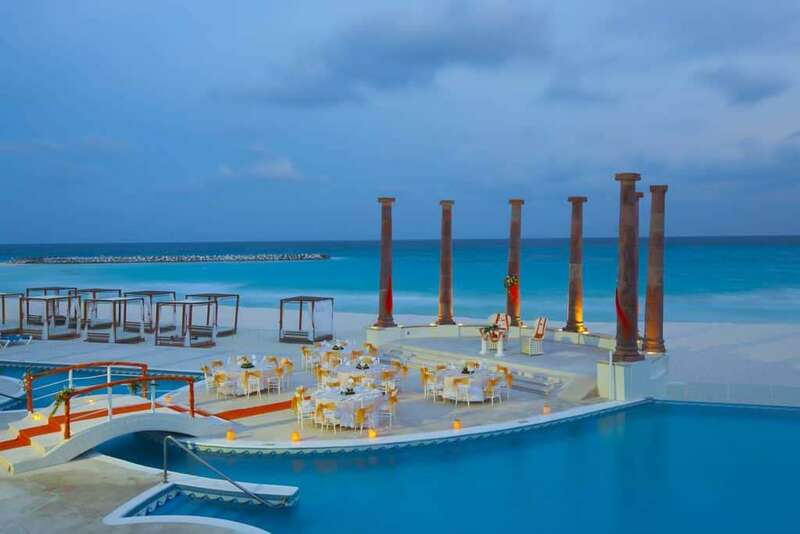 What is the location of the Wedding Function?